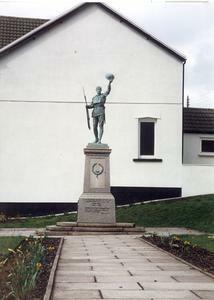 Statue of servicemen with helmet raised and rifle in the other hand. On the 9, 12, and 3 o'clock faces of the plinth are the WW1 names on rectangular plaques set into the stonework. On the base are rectangular plaques on the same faces with WW2 names. The whole is set on a paved area with surrounding grass and flower beds.